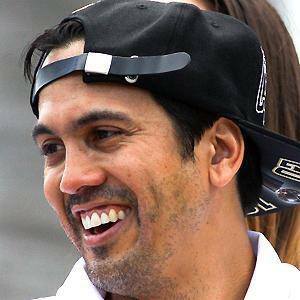 NBA head coach who led the Miami Heat to NBA titles in 2012 and 2013. He was named Conference Freshman of the Year while playing point guard for the University of Portland. He started working as a video coordinator for the Heat in 1995 and became an assistant coach two years later. His parents are named Jon and Elisa and he has an older sister. In 2015, he got engaged to former Miami Heat dancer Nikki Sapp and the couple got married in July 2016. He was pressured to win an NBA Championship when LeBron James joined the Heat in 2010.